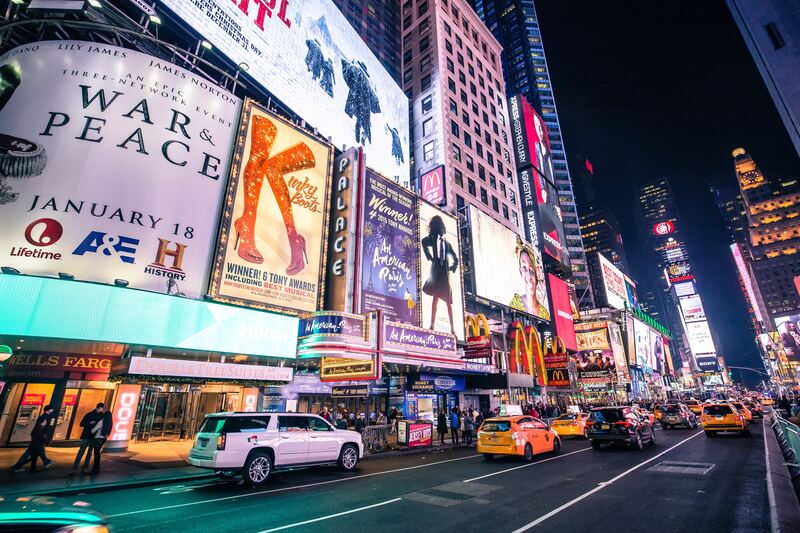 New York City, the city that never sleeps! We visited New York City in March of 2017 after visiting Darah’s grandparents in upstate New York for a couple of days. It was very cold and a blizzard had blown through the week before our arrival. That said, the cold didn’t stop us from being excited about all the things to do in NYC. 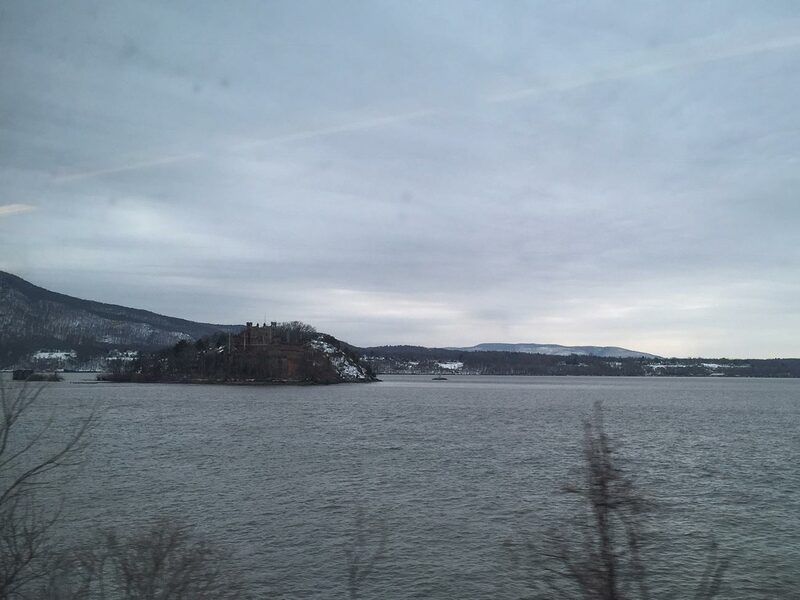 We got to take a two hour train ride through beautiful, snow-covered upstate New York on our way to NYC. Our ride was from Poughkeepsie to Grand Central Station. And boy, was it grand. So much detail went into building this huge and fascinating hub in New York City. 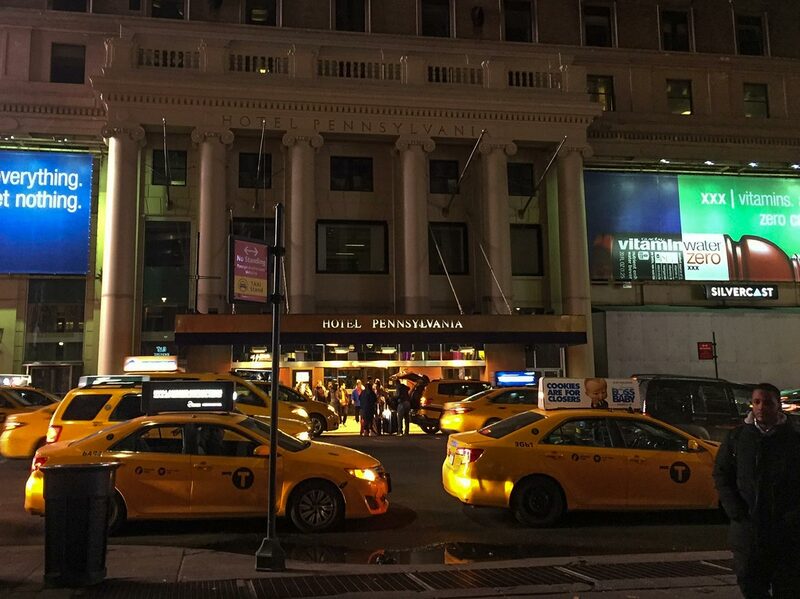 From Grand Central Station we hopped in an Uber to our lodging, Hotel Pennsylvania. And so began our NYC adventure. We walked almost everywhere we went. For instance, we ended our our first full day at 13.1 miles walked. We were a little tired to say the least. 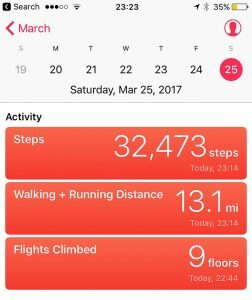 The next day was 11 miles. Seems crazy now. However, this was the best decision we could have made, as it led to an amazing couple of days where we saw so many sights by happenstance and saved money on transportation! It led us to explore Chicago in a similar fashion. More on that here! Unlike Chicago, we did not buy a CityPASS or Go Explorer Pass for NYC. Unfortunately, we didn’t even know these existed when we went! Sad day. These are a great deal and definitely worth checking out. However, it seems Go Explorer Pass beats the CityPASS for options and cost. Just don’t use your pass at the American Museum of Natural History. Admission is not a set price. We recommend “buying” your tickets at the counter, not online. You’re allowed to donate what you deem as appropriate for admission and then certain exhibits cost extra, like the planetarium. 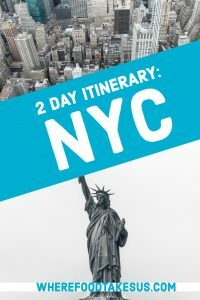 If you’d rather skip the story and check out a concise list of our itinerary, as well as other great things to do in NYC, then scroll on down! Let it be told, this is our only vacation that we haven’t stayed at an Airbnb, besides camping in a tent or staying in a yurt. There are so many Airbnb’s in NYC, but technically they’re illegal. That’s the case in a lot of places though and that didn’t stop us from trying. What stopped us from staying in an Airbnb in NYC was the fact that most hosts we found in Manhattan asked you to not disclose you’re a guest, to be discreet, or to not talk to neighbors. We don’t blame the hosts; NYC is cracking down on Airbnb. So we figured, with the prices of Airbnb being pretty similar to some hotels, to just forgo the secrets and stay in a hotel. If looking for lodging in the Big Apple, give Airbnb a shot. We’re sure there’s a great one out there. If not, Hotel Pennsylvania is a great choice! Hotel Pennsylvania isn’t the fanciest or most luxurious but it’s got history (Darah’s grandma would have girls weekends here back in the day!) and was the best deal we could find in Manhattan. 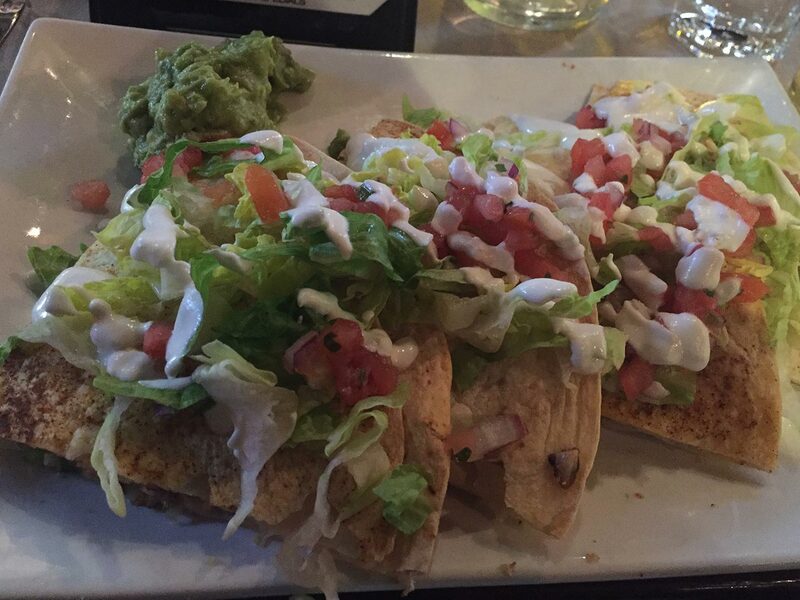 Its Google reviews aren’t the best either, but we thought it was great! We were barely in the room, after all. Our train arrived after 4pm on a Friday so most of our day was lost, but there was still time to make something out of it! If you’re in need of something to do on a Friday evening or arrive in the late afternoon like we did then you should make your way to the Museum of Modern Art, MOMA. On Fridays from 4pm to 8pm the museum is FREE for all visitors! Keep in mind that since it’s free admission the museum will be very crowded. So if that would ruin your experience then maybe it’s best for you to pay to go on another day. For example, the crowd around Van Gogh’s Starry Night was enormous. Still a wonderful painting to see in person, even though you bump a few shoulders while waiting to see. Make sure to check it out! After the MOMA we walked directly across the street to Mozzarella e Vino, a cozy Italian restaurant serving up delicious eats and fantastic wine. We started off with some Pecorino Toscano and Prosciutto di Parma. Their menu is seasonal but when we dined there we had the lasagna al forno and ravioli del giorno and they were incredible. 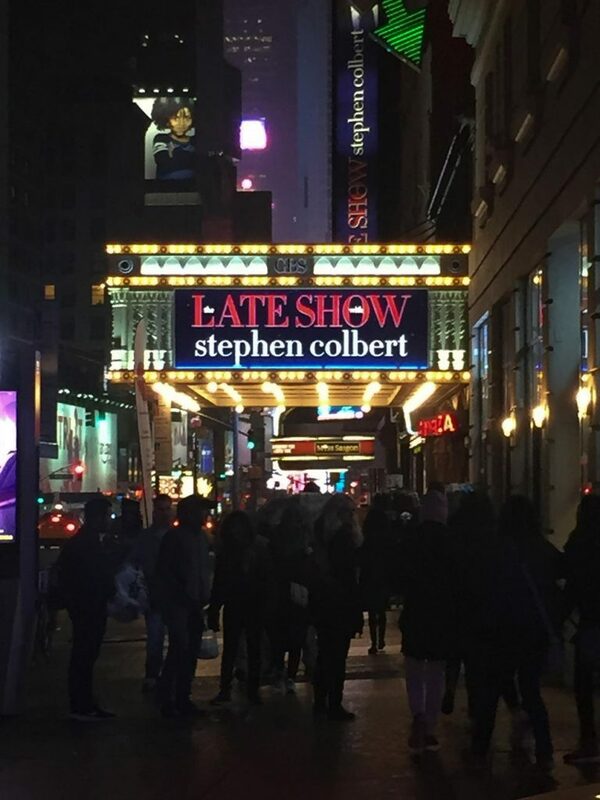 On our way back to Hotel Pennsylvania we caught our first glimpse of the bright and flashing lights of Times Square. We walked around for a little while and entered some shops; shopping in these places isn’t our cup of tea. You can find these same shops in Vegas or the Magnificent Mile in Chicago. We took in the sea of people and bright lights and once we’d had enough, we made our way to our warm bed. Day 1: We’d write out everything we did but this heading would be huge. Keep reading! We woke up bright and early so that we could get a jump start on our day. We made our way to Penn Station where we breakfasted on donuts and coffee and then hopped on a subway to South Ferry Station. Little did we know this would be our only subway ride of the trip. 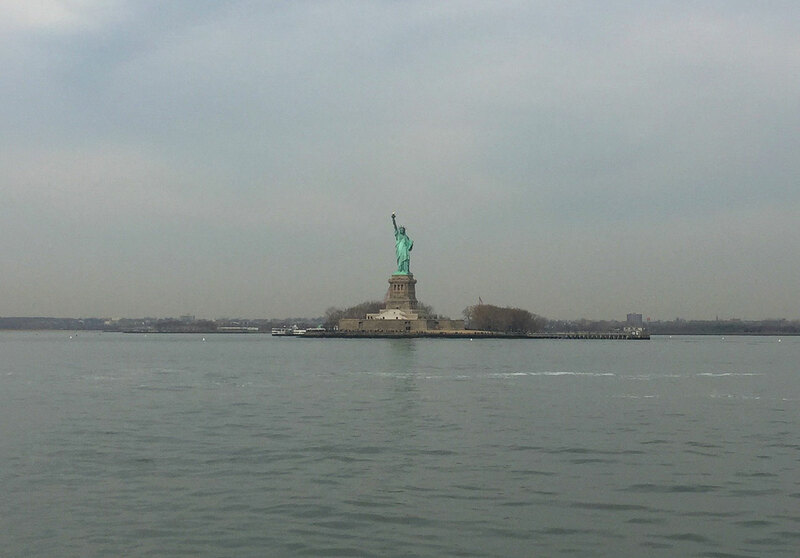 See the Statue of Liberty…For Free! The Statue of Liberty had been on our list for a long time. Ideally, we would have liked to go to the top but those tickets are booked months in advance. 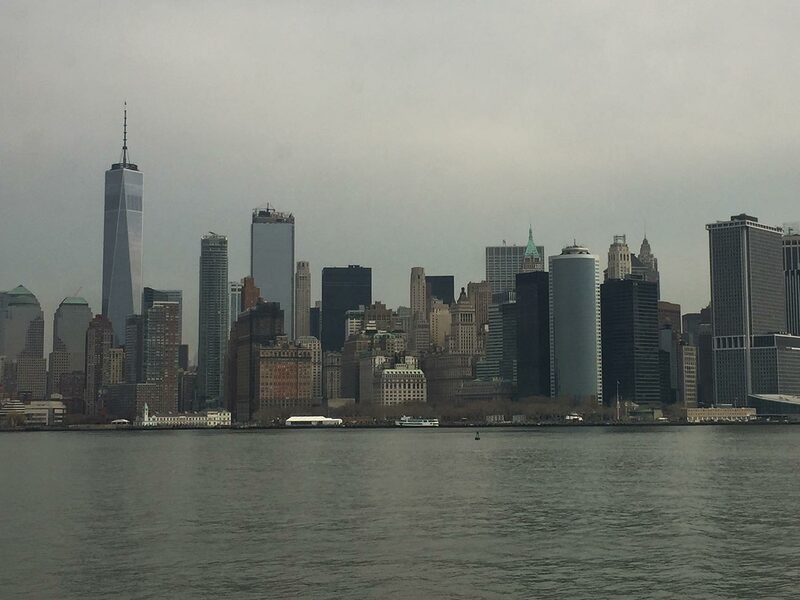 If you’re like us and you don’t see a point in paying to just go to Liberty Island then take the Staten Island Ferry. It’s free and runs frequently during the week. You’ll get a great view of the Statue of Liberty as you make your way to Staten Island and then you’ll see her again as you go from Staten Island back to Manhattan. 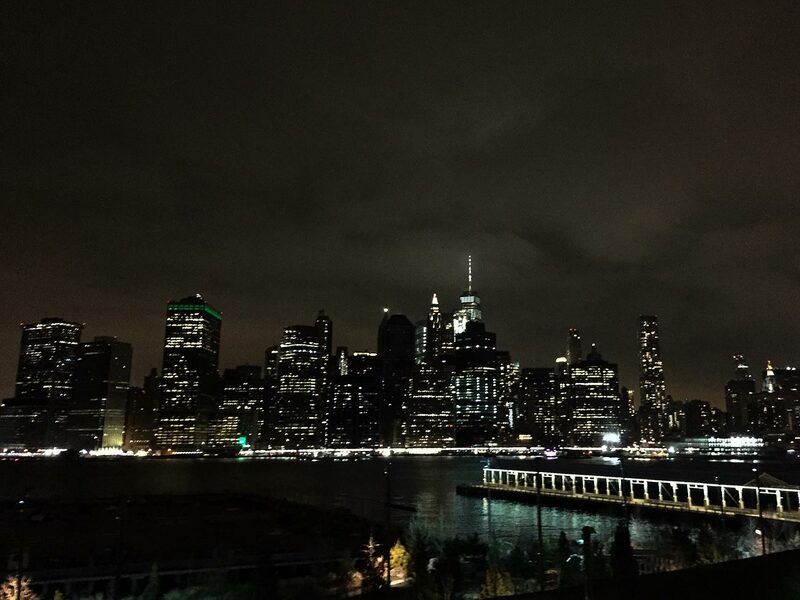 You’ll also get awesome shots of NYC itself! After you get to Staten Island, just exit the boat (everyone must), and then hop back in the line to get on. The ferry was spacious and there were great spots for pictures. When we returned to Manhattan at 9am we had no idea what we wanted to do next. No game plan. Our only obligation was to be in Little Italy by 5pm to eat dinner with Darah’s aunt and uncle, who live in Jersey. It didn’t talk long to figure out our next step as we looked up to the sky and our answer was shining in the clouds. Freedom Tower. It didn’t look like it was too far so we decided to walk there. We’re glad we did! 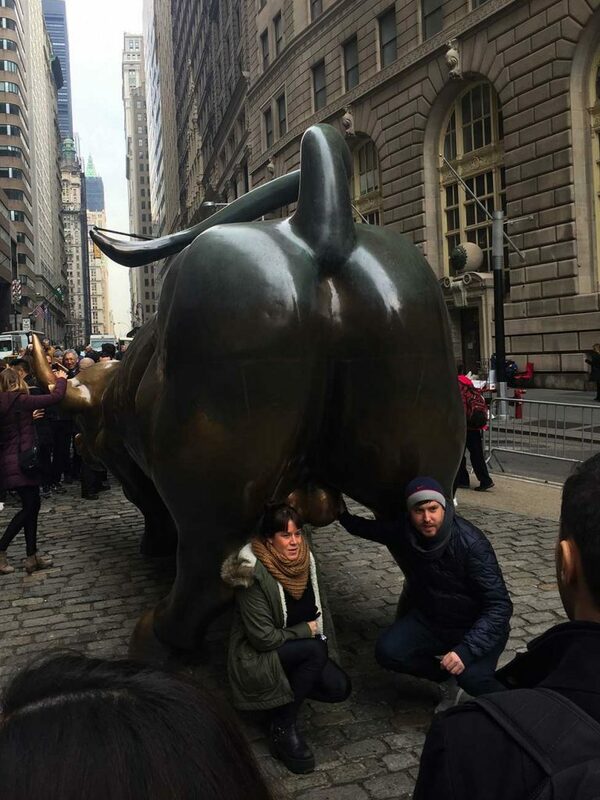 If you walk to Freedom Tower from the Staten Island Ferry then you’ll get the chance to walk through Wall Street and see the Charging Bull. 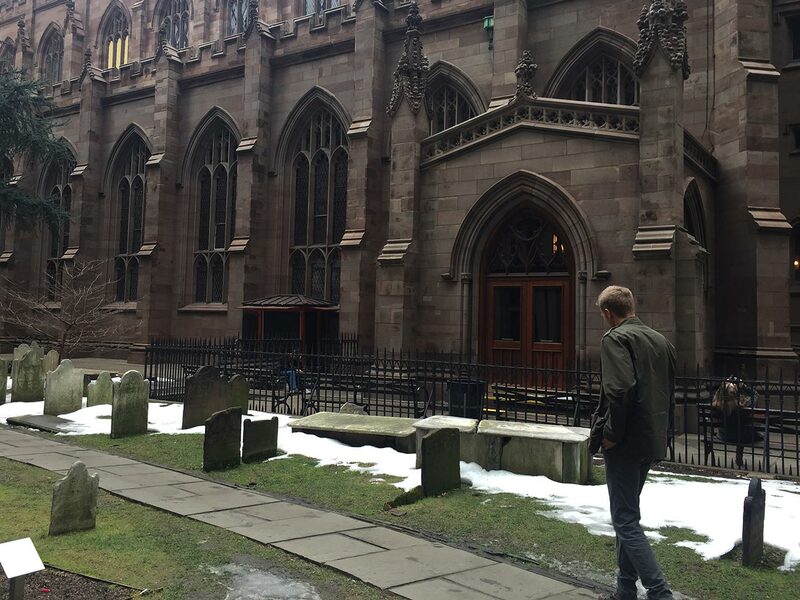 There are other great historical stops on the way like Trinity Church. You know, the church where Nicolas Cage found billions of dollars worth of treasure buried underneath it by following a series of clues he found after stealing the Declaration of Independence. That church. It’s also where Alexander Hamilton is buried. 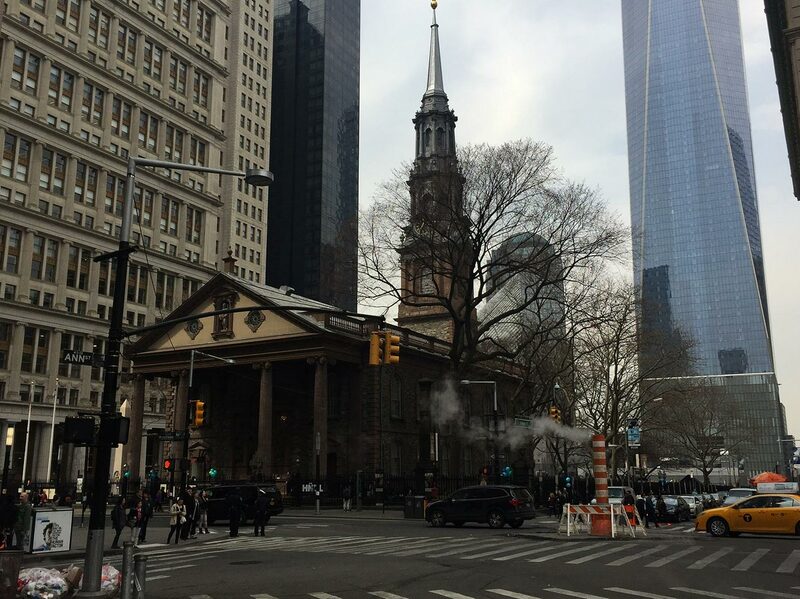 There’s also St. Paul’s Chapel, where George Washington attended service while NYC served as the nation’s capital. There’s a statue of Benjamin Franklin nearby as well. After all the unexpected historical stops, we finally made it to Freedom Tower. 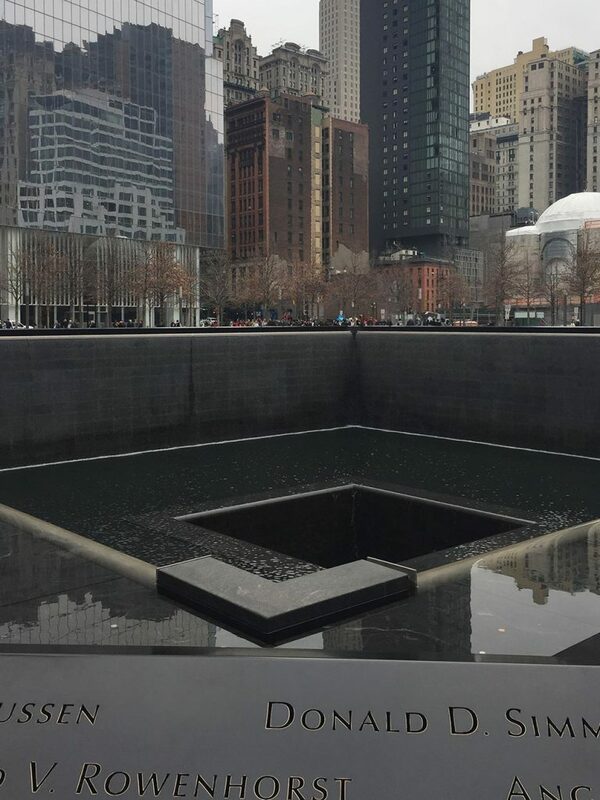 We didn’t make it inside the 9/11 Memorial Museum but the fountain memorials outside are surreal, as is standing in the shadow of this massive building. 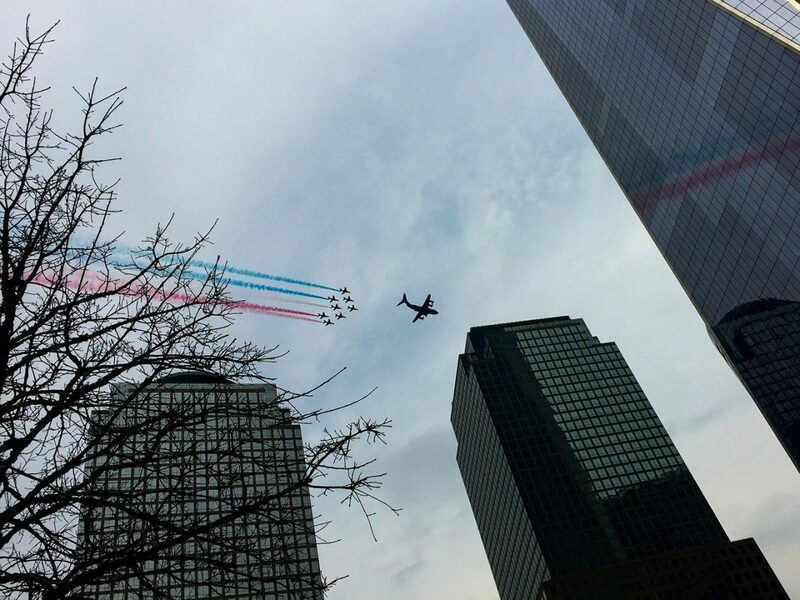 We were lucky enough to witness a fly-by where the military jets let off red, white and blue smoke. 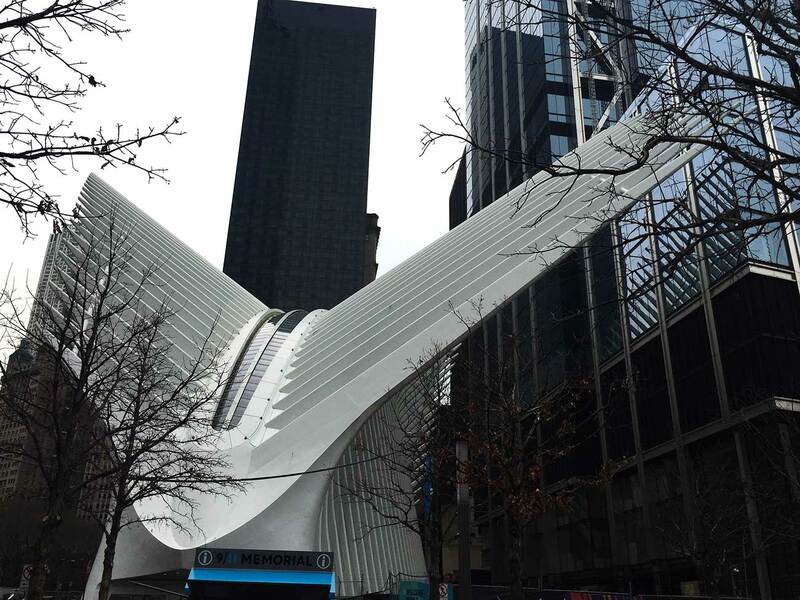 We found restrooms in Westfield World Trade Center, which is a vast shopping mall with some unique architecture, and then we set on our way to Chinatown for lunch! We wandered around, gawking at the unfamiliar markets and foods until we stopped at H.K. 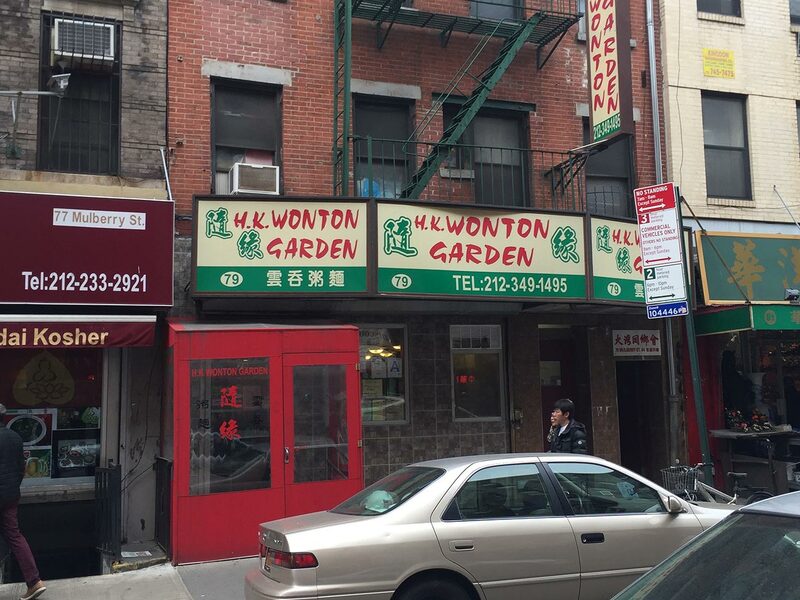 Wonton Garden. This small Chinese restaurant was just what the doctor ordered on this chilly day. Darah ordered pork dumplings with soup and Garrett ordered mushrooms and wontons with soup. It’s quite funny in hindsight. This food seemed very foreign at the time, but just over a year later, after leaving the USA to move to Taiwan, we’ve seen a lot of the food that’s offered in Chinatown and much more. Night markets, anyone? Check that out here! Once you’re full on Chinese food you can walk to the Brooklyn Bridge. If you feel like it you can even go to the other side! We just walked halfway, got some great pictures and walked back. When we were back on land we wandered around the area, grabbed snacks from food trucks and saw a couple of street performers. Then we made our way to the NYU campus and pretended like we were still in college. It’s a great campus to walk around and explore. We would have loved to go inside the library but couldn’t because we weren’t students. The campus is engulfed by trendy coffee shops and cafes so if you’re in the area and need to chill, you have plenty of options. After some time in the area, we headed to Little Italy to meet Darah’s aunt and uncle. We walked into a random Italian restaurant and sat at the bar and ordered a shot of Fireball to pass the time and warm ourselves up. Little Italy, which used to be huge, has been slowly shrinking due to the surrounding neighborhoods like Chinatown taking over but there are still a lot of great eats and shops! 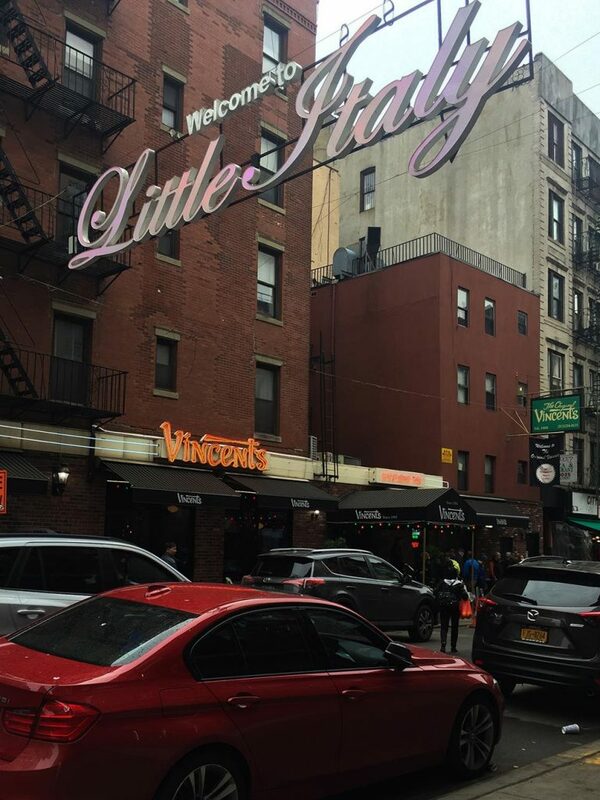 We ate dinner at The Original Vincent’s and had the Veal Parmigiana and Linguine with shrimp. Darah’s aunt and uncle were kind enough to drive us to Brooklyn after dinner so we could see Manhattan from across the river at night. It was a sight to see as we walked along the Brooklyn Heights Promenade. It was freezing cold but beautiful. 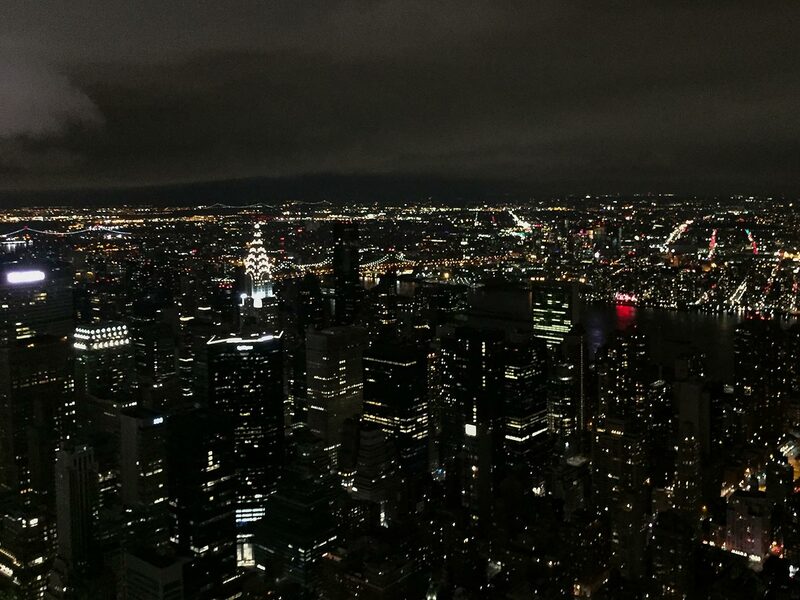 In our opinion, the best time to visit the Empire State Building is at night. One of the biggest cities in the world is alight below you. That said, it was March, pretty overcast, windy, and friggin cold. So we didn’t stay forever. Just long enough to savor the view. You practically have all night as it’s open until 2 am. Maybe your night will be warmer! Yes, we had so much Italian food and wine that we were about to burst. But that didn’t stop us from hitting up Papaya Dog (open 24 hours) when we made it back down from the Empire State Building. Day 2: Again, this header would be too long if we listed everything. Read on! 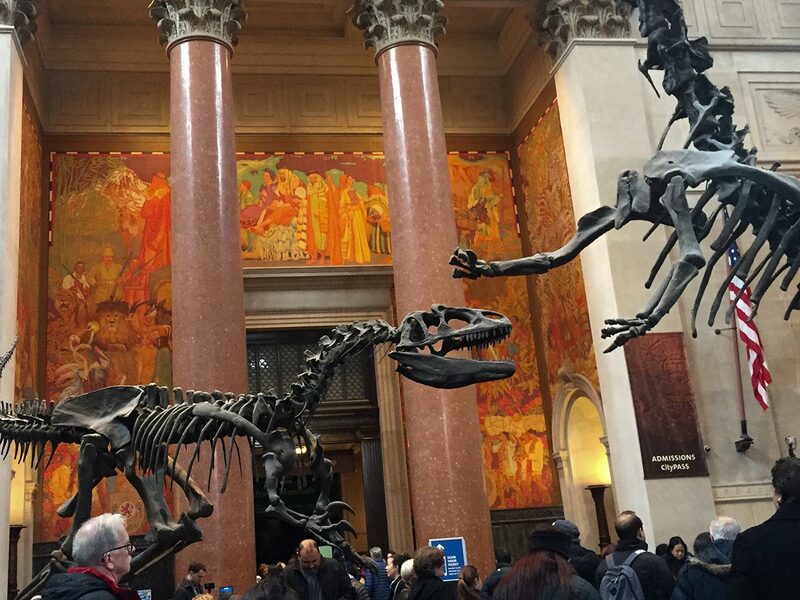 We started our day at the American Museum of Natural History. This museum is massive and would take multiple days to see. Or maybe if we hadn’t walked 13 miles the day before we’d have had the energy to make it. This museum, full of so many great exhibits, is technically “pay what you want” if you buy tickets at the counter but if you want to see any of the special exhibits then you have to pay for them separately. We purchased tickets to see the Dark Matter show narrated by Neil DeGrasse Tyson at Hayden Planetarium and would pay for it again. This was our best planetarium dome theater experience to date. It’s also the largest we’ve visited. New York Style Pizza…It’s About Time! After the museum we needed to refuel so we found the nearest pizza restaurant and enjoyed an entire pie of pepperoni pizza at Patsy’s Pizzeria. SO greasy…sooo good. 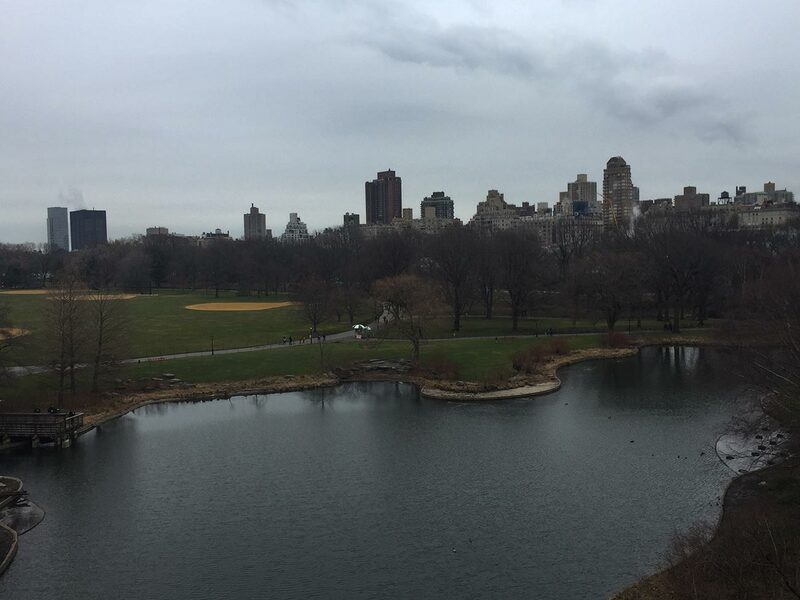 Central Park is better seen when it’s warmer and less grey, but we still enjoyed it nonetheless. There’s so much nature in the middle of a huge city. There are cafes, recreational fields, gardens, and Belvedere Castle. Belvedere Castle was built in the 19th century and was eventually used as an observation deck for meteorology. It’s a fun sight to visit and offers some great views of the park and city! Careful going up and down the spiral staircase, it’s practically a one-way street. After Central Park we made our way to 5th Avenue and started the long walk back to Hotel Pennsylvania. There’s a lot of great architecture to see while walking on 5th Avenue and a lot of high-end shopping (if that’s your thing). 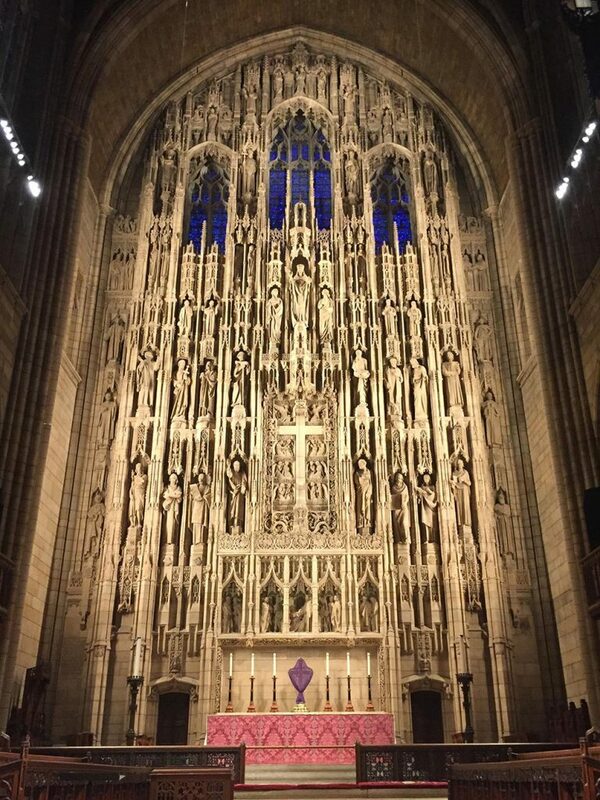 As we were walking down 5th Avenue we came across a church offering a free organ concert. Turns out it was St. Thomas Church, a beautiful Gothic style building. We caught the last few songs and this turned out to be one of our favorite parts of the trip. Free music and a beautiful setting. 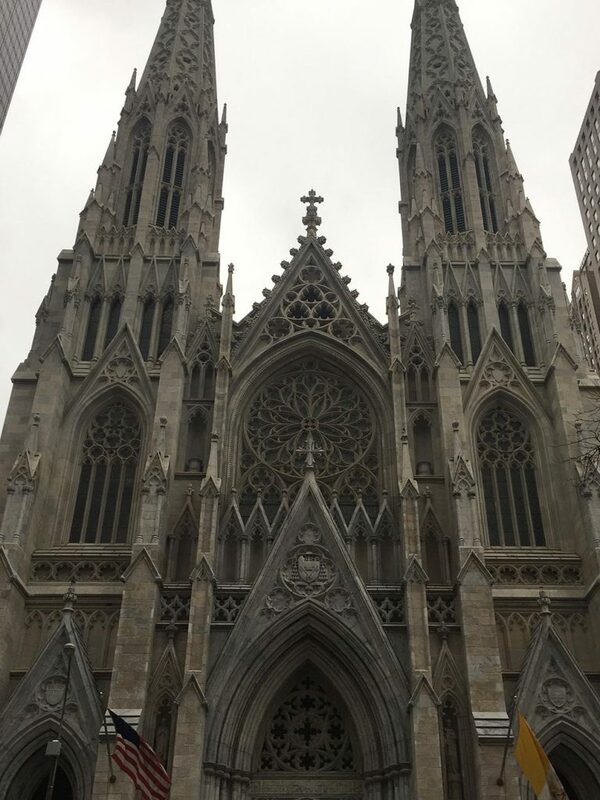 St. Patrick’s Cathedral is famous in New York City and it was obvious why when we walked up and stood in its magnificent neo-Gothic shadow. We arrived during 4 o’clock mass so to not be rude, we left after a short time and unfortunately didn’t get a closer look. Even if you just saw the outside, St. Patrick’s is worth a visit. At this point we got off 5th Avenue and walked past Rockefeller Center, which has an observation deck with cool views of NYC. 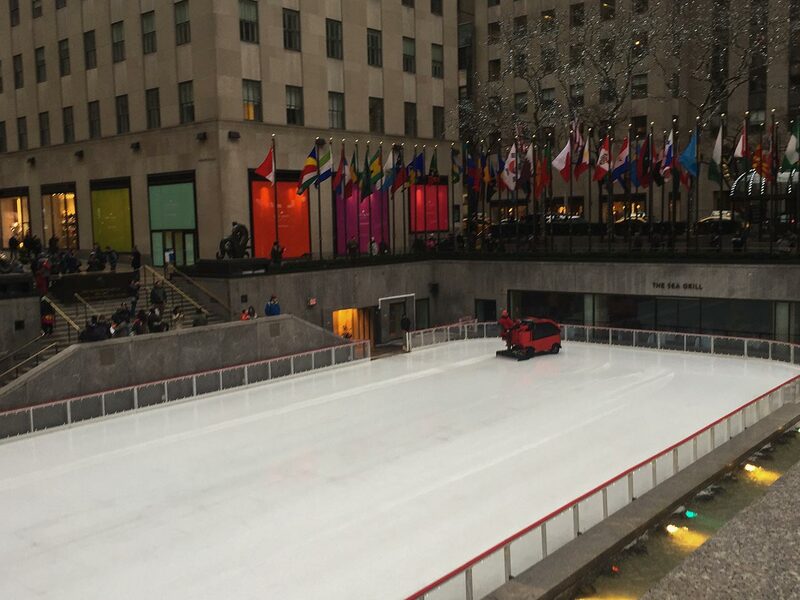 Or if it’s the right season you can ice skate on their iconic rink. 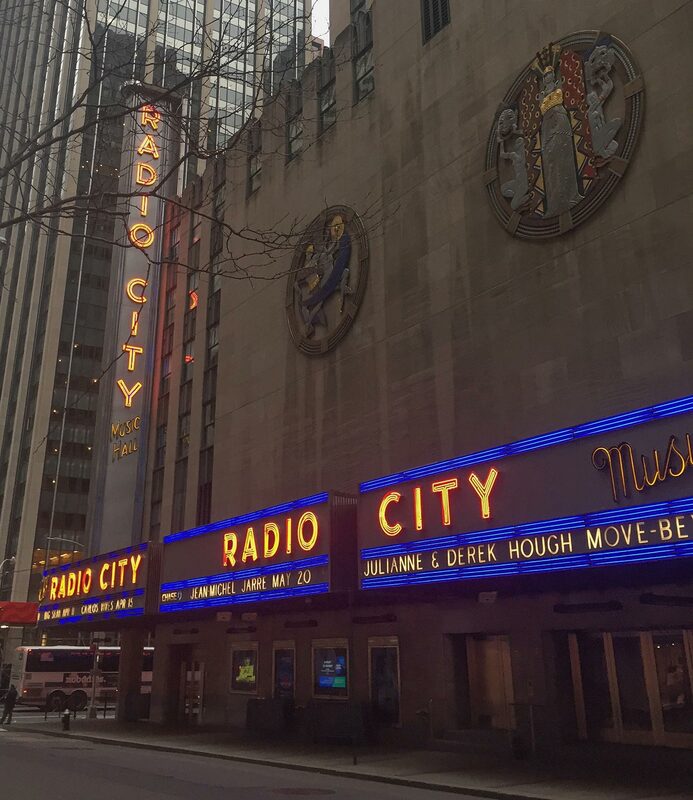 If you walk to 50th Street and 6th Avenue then you’ll be able to see the entrance to Radio City Hall where if you’re lucky you can catch a concert or show. 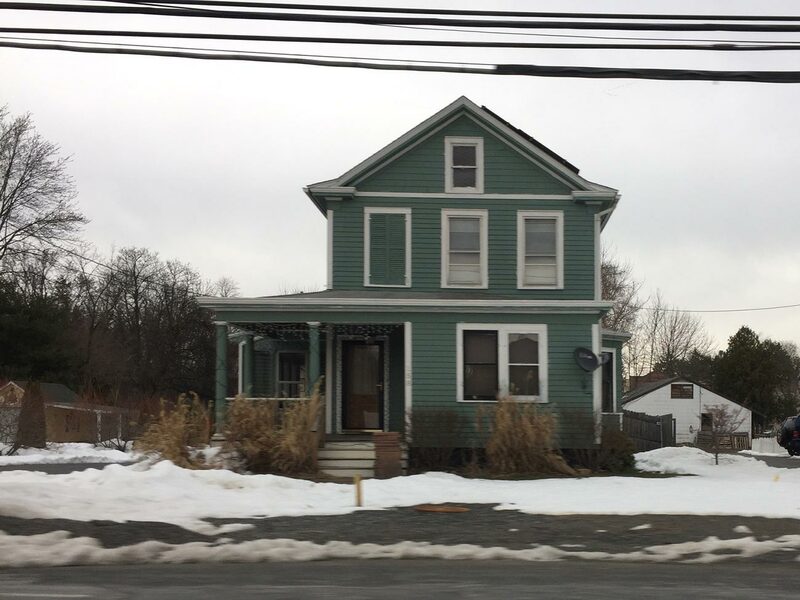 We would have loved to see a show here, but not this time around. We will try again in the future! This is exactly what it sounds like. A bacon bar. A bar resides in the center of the restaurant, surrounded by booths and tables. What’s on the menu? You guessed it. Bacon! This savory restaurant is one of many in Hell’s Kitchen. 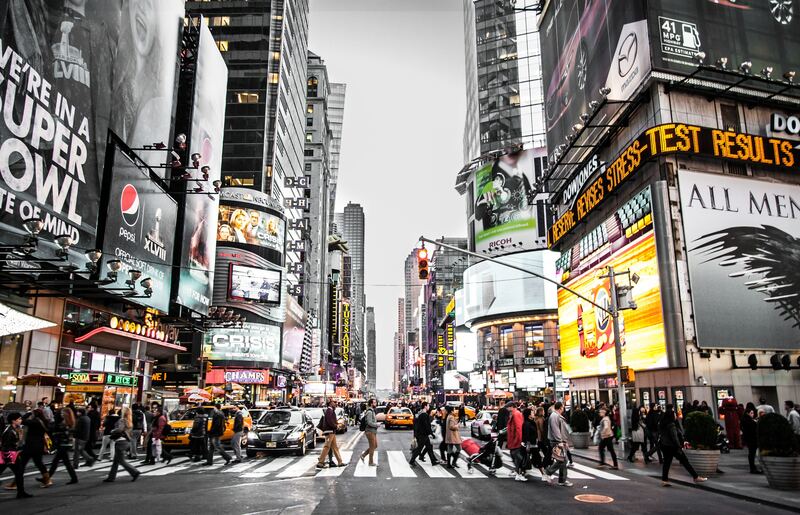 Other Great Things to do in NYC! 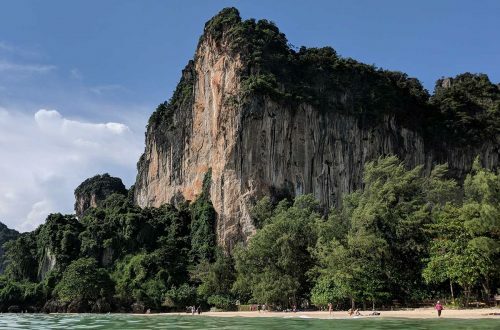 We’ve seen someone sporting a Yankees hat in every destination in Asia. They’re a big deal. 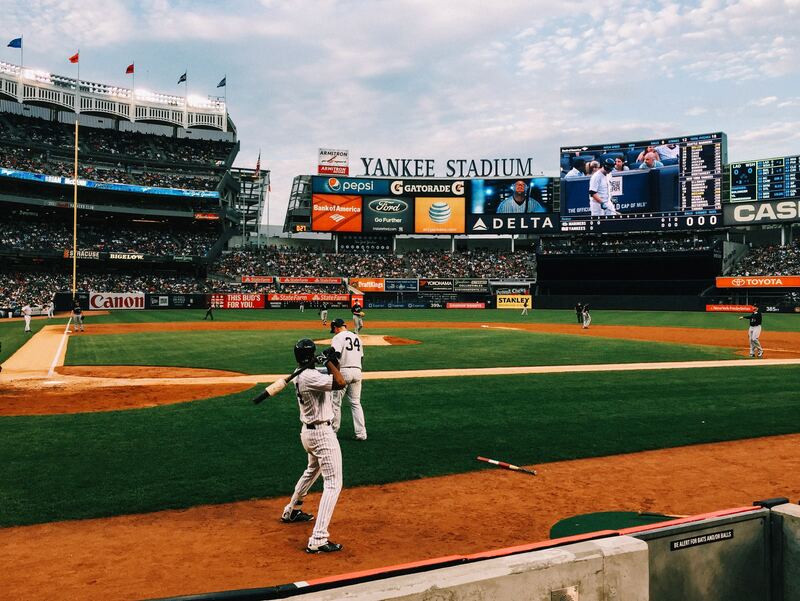 Catching a game, a dog, and a cold one with some great weather would be a good time! 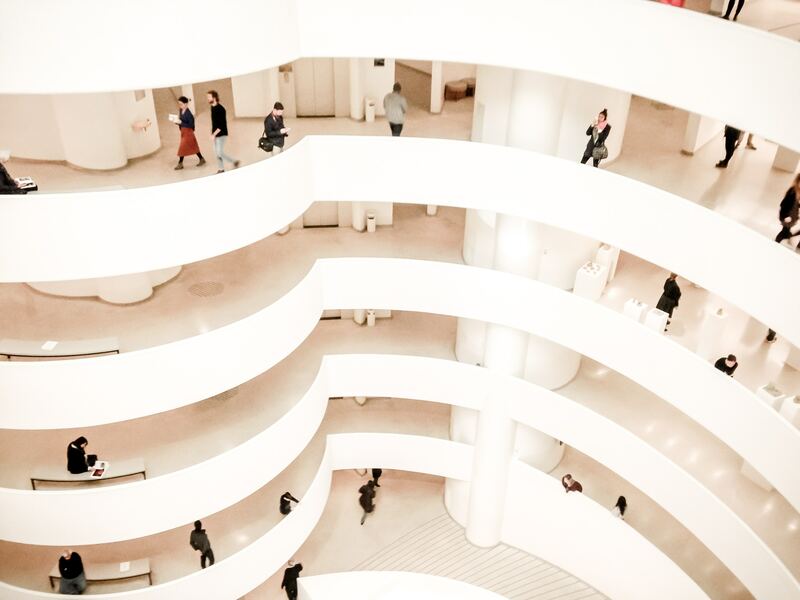 This museum has artwork spanning over 5000 years and is the largest art museum in the United States. The MOMA was free admission so that’s why we went there instead. But the Met is where it’s at and where we’ll definitely go next time. Has a collection of impressionist, post-impressionist, early modern and contemporary art. The building was designed by Frank Lloyd Wright. The observatory you can visit at the top of Rockefeller Center. It’s a different viewpoint from the Empire State Building and not quite as high. This takes some major planning ahead. You have to figure out when the lottery is for the upcoming season and enter it. You don’t get to pick the date or time of the show if you win the lottery so be prepared to plan your whole trip around it if you win. There are so many things to do in NYC. I mean, we’re just writing about Manhattan here. There are 5 boroughs! 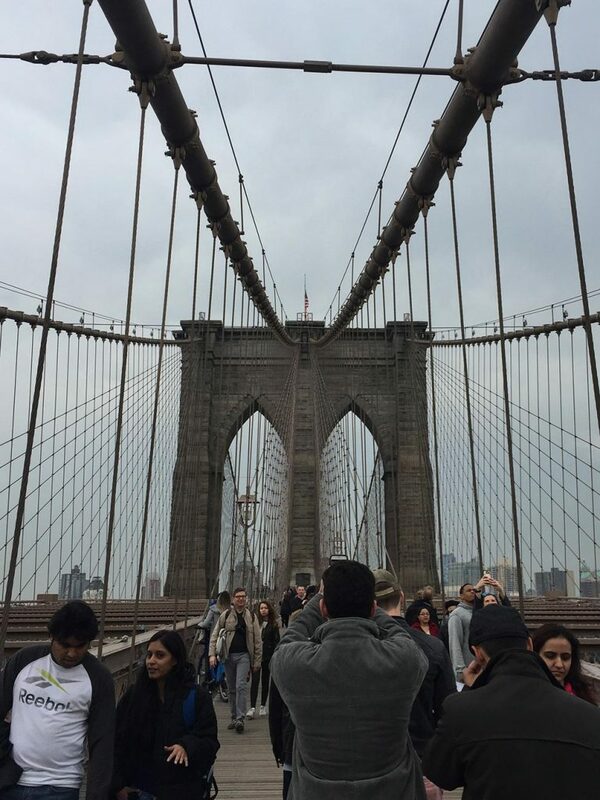 Word on the street is Brooklyn is the new Manhattan, so you may want to cross the river. No matter what your itinerary details are, you’re in for a treat in America’s biggest city! Have you been to NYC before? 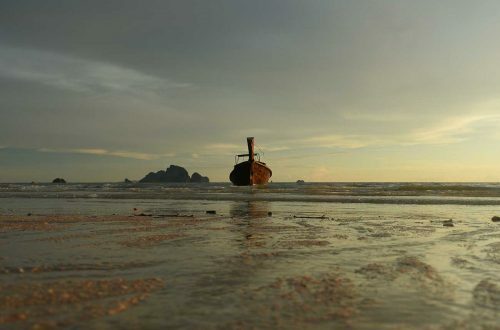 Going soon? Comment below about your experience or what you plan to do! If you’ve been or are going in any other season than winter we envy you.